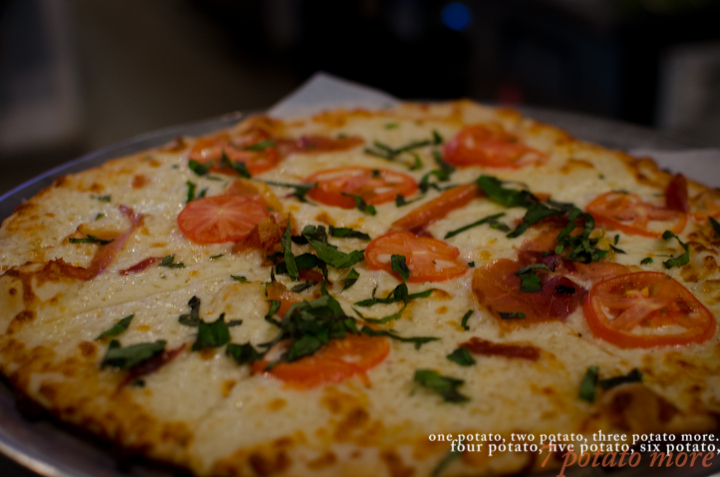 Posted by ccdc in american, cheap eats, delivery, happy hour, pizza, washington d.c. The block of Pennsylvania between 17th and 18th is dotted with several eateries and coffee shops that are easily missed if you’re not paying attention thanks to their recessed storefronts at the bottom of large office buildings. Although this is a block that I frequently walk down (usually to go to Roti for lunch), I only recently noticed that Chop’t and Jimmy Johns have locations on the block (and I’m told that they’ve been open at least a few months). Next door to Roti is Upper Crust Pizzeria, a Boston-based pizzeria with its D.C. outpost serving a distinct D.C.-oriented menu. Although I am not a huge pizza fanatic, thin crust pizza holds a special place in my heart, and that is the only kind Upper Crust serves. We decided to order two small specialty pizzas, The Dupont (white pizza topped with prosciutto, fresh basil and tomato) and The Nationals Park (Italian sausage, bell peppers, sliced onions). I was expecting personal-sized pizzas, but Upper Crust’s “small” pizzas are 14″ or the typical size for large pizzas at most pizzerias. If I had noticed the diameter on the menu, we may have only ordered one pizza, but at the happy hour price of $10 per pizza (+ discounted draft beers), this was still our cheapest happy hour outing yet. 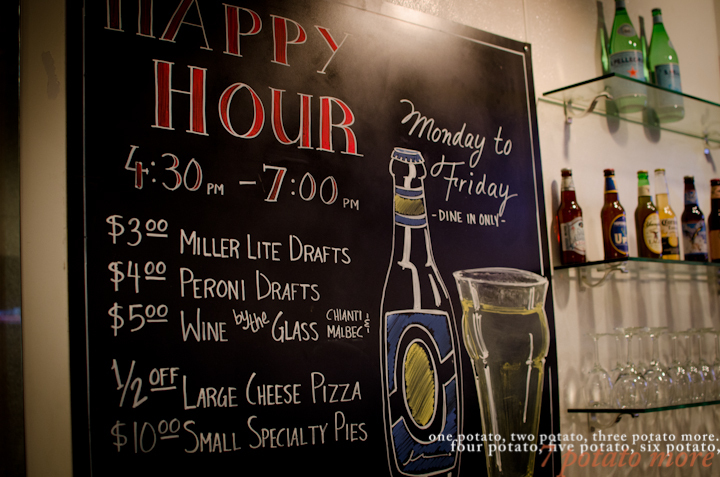 With its gourmet toppings, chewy thin crusts, and a friendly bartender slash iPod DJ, Upper Crust’s happy hour should not be missed! 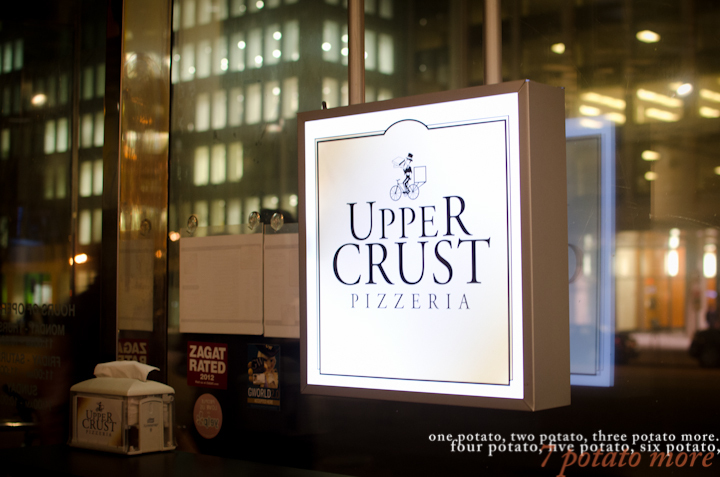 Upper Crust also delivers for free (min $10 order) to Foggy Bottom, Georgetown, and within a 1-mile radius of the store in NW. Posted by ccdc in american, happy hour, italian, washington d.c.
Don’t miss a special holiday happy hour tonight and help end childhood hunger in America! 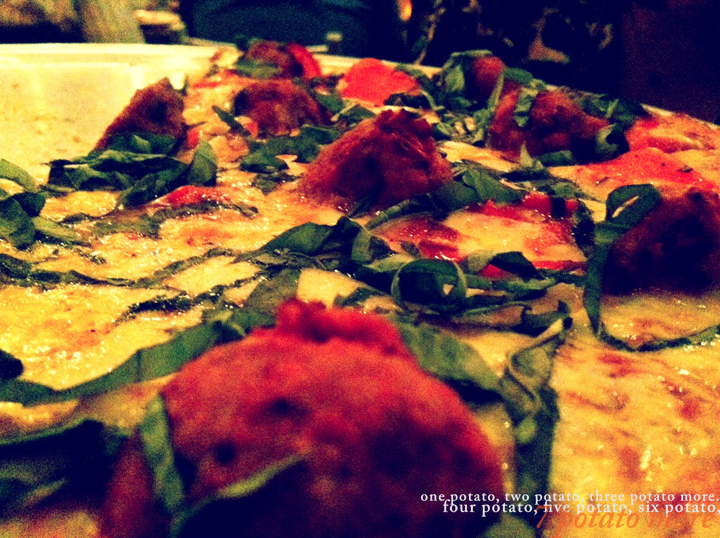 Join Taste of the Nation DC on Monday, December 12 at Graffiato for a holiday happy hour! A portion of your $25 ticket will support Share Our Strength and help fight childhood hunger in America. Your ticket also includes a complimentary glass of house wine, draft beer or Graffiato’s signature punch as well as a shared sample of oven fresh pizzas and a selection of small bites provided by Graffiato. All are invited, so please share this with your friends! Remember, tickets are limited – purchase today & kick off the holiday season by supporting Share Our Strength! Posted by ccdc in american, pizza, washington d.c. I have a small group of college friends that have endured the test of time. After college, we went our separate ways (geographically and otherwise), but over the last few years, we have reunited in D.C., and this past year, we established a monthly happy hour/dinner to catch up on our lives. Although, in many ways, we could not be more different, in every way, there are few things more comforting than old friends who require little or no explanation and just “get” you. So once a month, over a few drinks, we meet up after work, talk about our suddenly expanding hips, vent about our “careers,” and of course, trade stories about boys. We went to college in St. Louis, so it was fitting that we decided to meet up at District of Pi Pizzeria this month. While I visited friends in St. Louis almost two years ago, I dined at one of Pi’s St. Louis locations, so I was excited to hear they were expanding to D.C. Admittedly, it was only recently that I connected Pi with both pie and 3.14 (314 is St. Louis’ area code). Pi first landed in D.C. via its pizza food truck, serving its deep-dish cornmeal crust pizza to downtown’s hungry lunch crowd. It then opened its spacious (it just keeps going!) brick and mortar location in Penn Quarter, at 9th and F Street NW. The menu draws from both St. Louis and D.C. landmarks/neighborhoods. 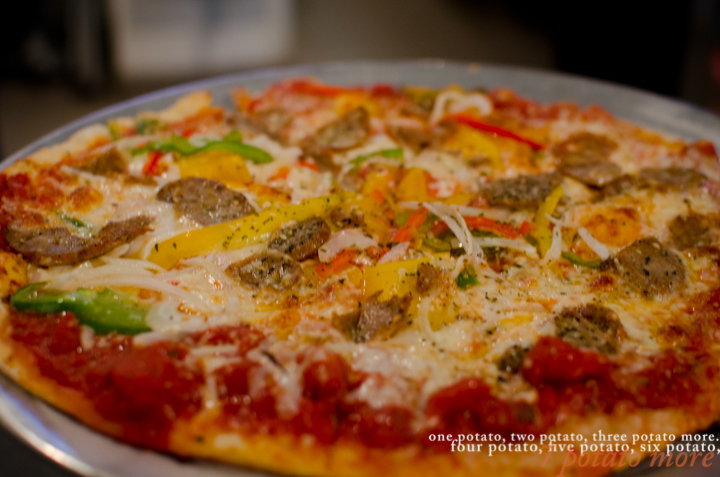 For this visit, we were feeling nostalgic and went for the Kirkwood, a pizza named after a quaint St. Louis suburb and topped with mozzarella, italian meatballs of hormone-free pork and beef, red peppers, and basil. Although the Kirkwood is listed as a deep dish on the menu, we opted for the thin crust version. 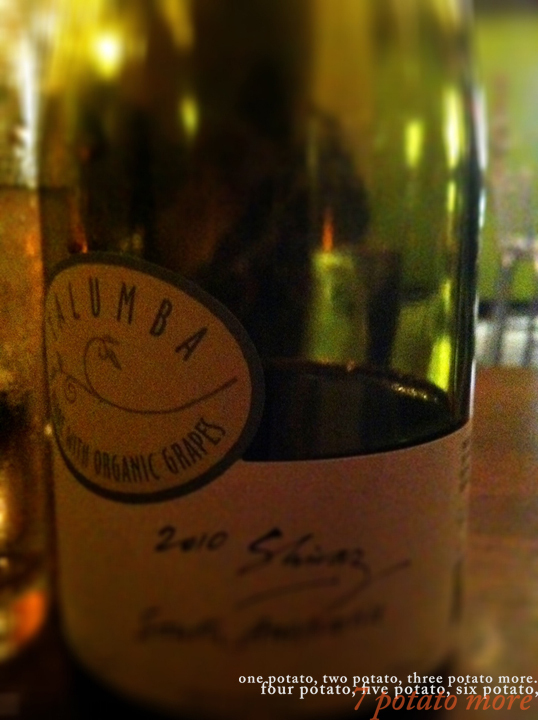 Of course, ordering a bottle of wine was the most “economical” approach to wash down the pizza, and we selected an Australian Shiraz (my red of choice). Gourmet pizza, red wine, and old friends. . . that’s pretty tough to beat.